You know what they say. When squirrels hand you acorns, make potpourri. Recently Apartment Therapy featured a painted acorn project that I had pinned from Home Stories A to Z last fall and was itching to do once the acorns started coming down in droves this year. I was so inspired by this adorable acorn makeover, but I knew I wanted to add my own twist to this fun and simple project. 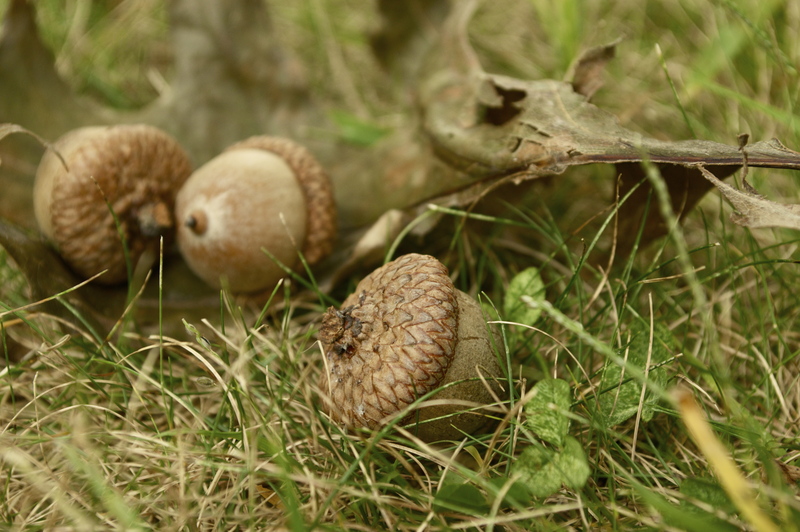 After one sniff of my newly foraged acorns, I knew what that twist needed to be: potpourri. How can I describe the smell of an acorn? I think “earthy” is the nicest way to put it (but “muddy” would be more accurate). While I’m sure their natural scent would have faded after completing this project, smelling delicious is never a bad idea. The first thing I did to begin my acorn adventure was wash the acorns with water and pat them dry with a towel. Though they may feel dry to the touch, you have to bake the acorns in order to really dry them out and make sure they won’t develop any kind of mold later on. 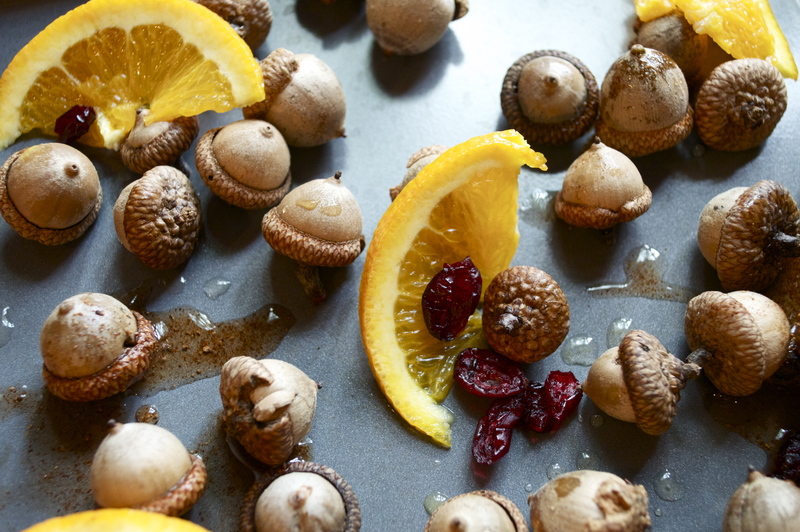 Next, I preheated my oven to 225°F and placed a single layer of acorns on a baking sheet. Before putting them in the oven I laid some thin slices of orange and craisins on the sheet and sprinkled some vanilla extract, ground cinnamon, and nutmeg over everything. Next, I let it all bake and dry out in the oven for about 3 or 4 hours, making sure to shake the tray and flip the orange slices every half hour or so. This process takes a little while, but it smells so good! The citrus scent of the oranges mixed with the warm, sweet vanilla makes your kitchen smell like hot cider. Yum! Once all the moisture was gone, I removed my acorn mixture from the oven, let it cool, and then placed it in an airtight container with some cinnamon sticks. 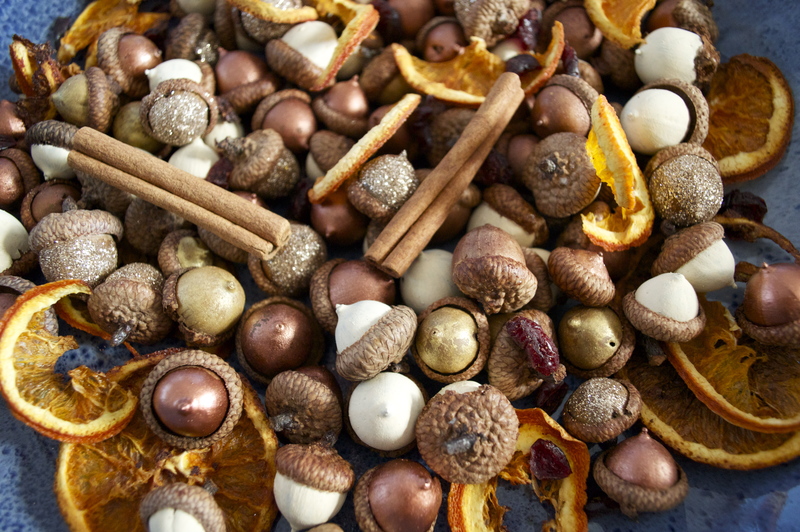 The longer you leave your potpourri in the container, the more potent the fragrance will be. I let mine sit for about a week before painting the acorns. 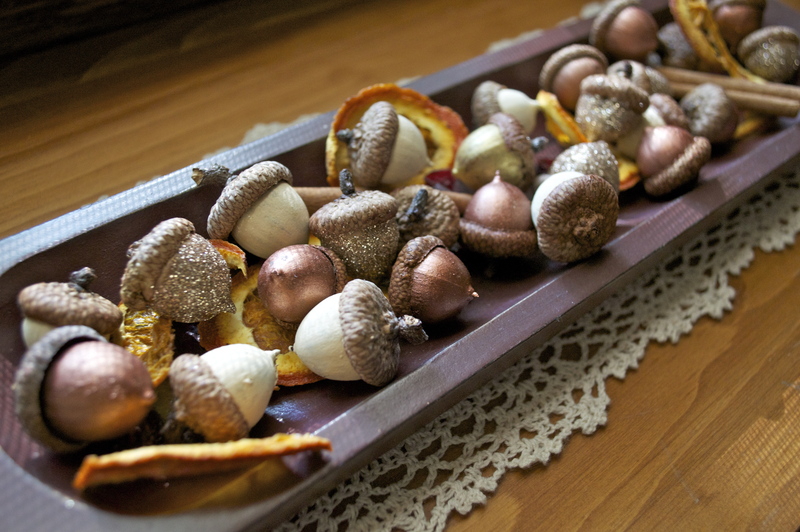 I wanted to keep my potpourri neutral with just autumnal hues, so I chose beige, copper, and gold acrylic paint. 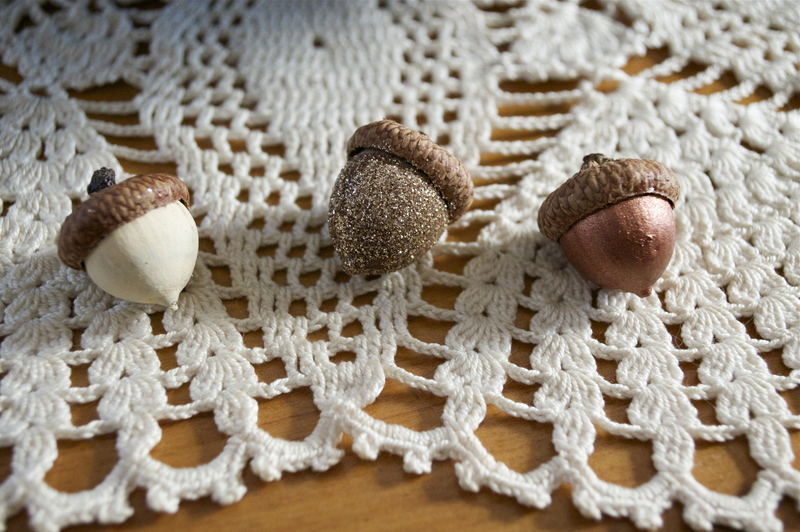 I also covered some acorns with champagne glitter using Mod Podge. Once the acorns were dry, my potpourri was complete!